I’ve spent the last few months preparing to move out of Ida B.Wells worrying about how to teach a culinary arts class without cooking. “Well, it’s not really a culinary arts class,” I’ve always told people. It is a work simulation class using culinary as a theme. Um, and that culinary part? It is a huge part for me, bigger than I first thought. It is what automatically connects us, automatically equalizes us, and with our combined efforts, feeds us on many levels. I have been moping a little that I won’t have the thrill of the stove, the splash at the sink, or the pressure of the period ending bell to accomplish what we’ve been able to these last 5 years. That and attitudes have been wafting through the halls, perhaps we might be assimilated into the larger school site that will host us? After all, we are a small, alternative school floating quietly on a increasingly crowded sea of requirements. We don’t fit a mold for good reasons. But one can’t plan anything when your attitude focuses on impending doom. Instead of planning, you develop a planitude – an attitude that distracts you, like a dark fog. Then a few weeks ago, I got to sit down with the project team to go over the renovation plans as respects my classroom, a basement area that has been Ida B. Wells’ cafeteria over the last 30 years (although every year I’ve been there I’ve inched into a bit more of it). 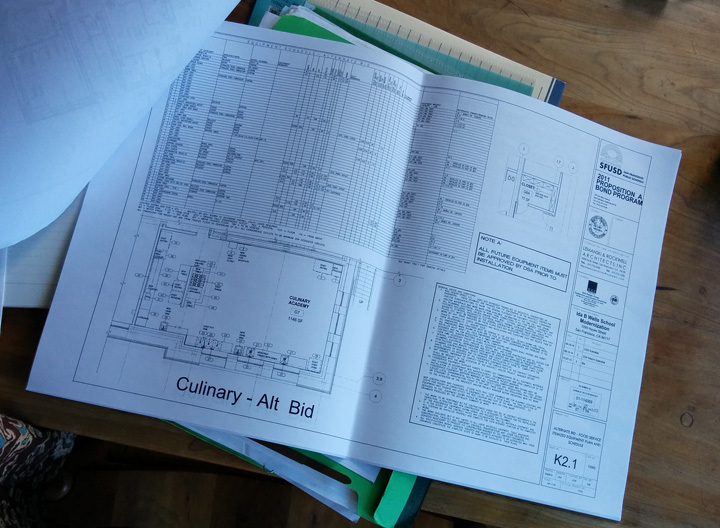 And as I sat there, with all these experts, seeing on the official black and white architect’s layout that they are building a real Culinary Arts classroom, with a full hood and ansul system, I started to get excited. All this trouble we are going through moving out is for good reason – our building is old and broken. And I have proof on these pages (which I’ve been carrying around with me like a security blanket) that we’ll be able to support students who need an alternative better than ever when we return in 2016. It really is happening. Now to get back to teaching and taking care of the students moving with us, with all the value, respect and hospitality we can muster. There will still be bumps in the road, but it is heartening to see a glimpse into our future like this one. So excited for you guys!! I’m tearing up as I scroll through the website and notice all the hard work that is being produced (still) from everyone on the team. I miss you guys and are sooooo proud of all of your accomplishments thus far – LTD 6!!?!???!! WHAT?? Already!! This program has come a long way, and I only wish you more successful trial and errors. What a great reward – A NEW (heat of the) KITCHEN! Great things come to those who work for what they believe in and are passionate about. Great work Mrs. Cravens and team. Love you guys always… and remember – the GARDEN is always Greener where we water it! You are awesome Tasha! Heat of the Kitchen wouldn’t be anywhere without your initial involvement. We hope all is well with you these days…love!! !